This is a descendant of the KJV, widely used by scholars across a variety of religious commitments. Available in many versions, including with notes as the Harper-Collins Study Bible or New Oxford Annotated Bible. I prefer the notes in the Harper. A newer revision of the NRSV’s predecessor the RSV. I have very strong feelings about the ESV Study Bible: avoid it, as the notes are selectively biased. The translation without extensive notes is fine, however. While you can buy one in print, it’s great advantage is the thousands and thousands of comments explaining the translation. It would be long if complete in print, but their study website is quite useful. This is the NRSV translation with commentary from a Jewish perspective, the same Jewish scholars who produced the Jewish Study Bible I refer to so often in my posts. It’s insightful but can be challenging, and some of it I disagree with. These tend to be a little quirkier since they are produced by individuals, but no less interesting. J.B. Phillips- A colloquial translation that captures some of the feeling, particularly in Paul’s letters, which were meant to be read out loud. NT only. If you want to know why the NRSV says one thing and the KJV reads differently, this is the resource to turn to. This is a fun, easy read. Me, “Why Bible Translations Differ: A Guide for the Perplexed” Religious Educator 15:1 (2014): 31-65. An article looking at four categories of reason why Bible translations differ, extensive study suggestions, and discussion of the relevance of the JST and Book of Mormon text on our understanding of the Biblical text. Hardy is a history/religion professor on the east coast and a member of his stake presidency. He’s published some very good stuff in Meridian Magazine, but also published several relevant books, including Oxford Press’ Understanding the Book of Mormon: A Reader’s Guide (review) and The Book of Mormon- A Reader’s Edition. Alter is a professor of literature and Hebrew at UV-Berkeley, and does great work. I’ve recommended many of his books before and will again. Responding in some ways to Barlow and Hardy is Ronan Head, “Unity and the King James Bible” also in Dialogue. Part 2 to follow in a few weeks. May be relevant to mention that the “Gospel Library” collection is officially produced by the Church, and is free for downloading in a number of formats. It contains the King James Version of the Bible. Inspired revisions from Joseph Smith are included. If you’re worried about the Church’s view about other translations, go look at the General Authority statements and positive usages (quoting other translations in General Conference and the Ensign) here. Also, when I taught Honors New Testament at BYU, I and other professors required students to read a different translation, and the BYU bookstore put in a bulk order of non-KJV translations for the class. The KJV is our official Bible, but it need not be our only Bible. Another good volume that is online from the Religious Studies Center is “How the New Testament Came to Be,” which covers textual criticism, translation history, and other topics covered above. Ben, I loved your OT list year and appreciate this NT list. I was hoping for (maybe I missed it) for some books that might give historical, cultural, and socio-political background for the times of the NT. Also, I’ve loved Kugel’s and Brettler’s How to Read the Bible (which covered sections almost like the LDS OT manual). Are you aware of any books like those for the NT? JMS, thanks for the link! WPME- I’ve got a whole list of those, coming in the next post. I think we’ll end up with 3 posts total. The closest thing to BRettler for the New Testament I’m aware of is McKenzie’s How to Read the Bible, which includes the New Testament. McKenzie is a bit more cynical than I like, but I’m simply not aware of anything else that quite covers the area. My New Testament bibliographic-fu is not as strong as my Old Testament-fu. Not discounting the interest of alternative texts. Just wanting to be clear about the context. With the Church publications available to me, including scriptures, magazines, and Conference talks, I could keep busy studying for many years. Doctrinal “accuracy” (which is a moving target) is not the goal here. Rather, many people would actually like to understand what they read in the Bible, which means learning ancient languages ( fun, but quite difficult), mastering a mixed archaic dialect of English (also quite difficult) or using a translation that is not 600 years old (easy). In my lengthy teaching experience, LDS who begin using a different translation discover a love for the Bible and study it much more, increasing their total time studying instead of distracting from studying other things. It’s not a zero-sum game, and there are few downsides. Moreover, knowing the Bible and its contents well are a major way of building bridges or doing missionary work with others who know the Bible well. Using the KJV alone inhibits that. I’m going to put in a plug for the New Jerusalem Bible, which I use as my standard NT. Outside of the US it’s the most commonly used English version among Catholics, and one can access it online (though I’m one of those old codgers who insists on holding a book). My preference is mostly aesthetic rather than theological — I appreciate the beauty of its language which remains in a high register without being incomprehensible. Ben S., I’d love your thoughts if you have any experience with this translation. James- I own a copy (well, several) in Bibleworks, but have not used it much and can offer no opinion. Provided that it’s now based upon the actual Greek and Hebrew texts instead of the Vulgate like it used to be, I have no objections to it in particular. I’m not trying to convince people to abandon the KJV for Version X as much as begin consulting multiple, and understanding what’s behind the text. Ideally, I don’t want anyone wedded to any single version. Also, it’s easier to order off a smaller menu than a huge one, so I limit my suggestions. It’s not so much that I’ve evaluated all 500 English versions to focus on these 2 or 3 as much as these are good, so I’m limiting my suggestions there. As Elder Carmack said (paraphrasing), any translation responsibly made can serve our purposes. Ben….just wanted to say Thanks for doing this. Appreciate you sharing your talents, skills, and craft with us. I’m extremely grateful to you. It provides an excellent overview of the origins of the New Testament. It’s a nice place to start if you are new to the field. I think whatever Bible one uses…the important thing is to remember to pull the gospel out of the text…and not just the text off of the page. Then we see the Bible as a gracious message for sinners…and not an instruction manual for a holy life. Any thoughts on the NKJV? It may be a necessary transitional Bible for some. But I think it captures the worst of both worlds. It changes the archaic things that are easiest to master (archaic pronouns), but otherwise is still based on very late manuscripts, and translated into a language that is 600 years old. Joshua- Thanks for the feedback, it’s much appreciated. OldAdam- Indeed. Exegesis never converted anyone. Ben. 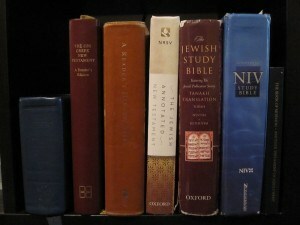 Your shelf looks a lot like mine (for Bible translations). I have also found the Revised English Bible (1989–jointly published by Oxford and Cambridge) to be very helpful as well. As for translations, I presume that you’re not including those of the Anchor Bible or Hermeneia (among others) as well as those in the BYU New Testament Commentary. In a future part, I imagine that commentaries (including those containing translations) will be included. Those are just my paper Bibles, Terry! I have access to many many others via Bibleworks. And yes, I’ll be talking about commentaries a bit in an upcoming post. Ben – Do you have any recommendations on apps? JT- For actual computers, the big 3 are Bibleworks, Logos, and Accordance. I wrote a BW vs. Logos post a few years ago, and the generalities about each program still hold. Both Logos and Accordance have smartphone apps, but I’ve only used Logos. I believe the NET Bible has an app, as does the Faithlife Study Bible (which is part of Logos)… but I haven’t used either. Afraid I can’t be much more help. The NET bible is on half price today for use with the free Olive Tree app. The NETBible uses an app called “Lumina.” It’s a little clunky to get around in, but if you can handle clicking through a small handful of screens (book, then chapter, then verse), it seems to work really well.